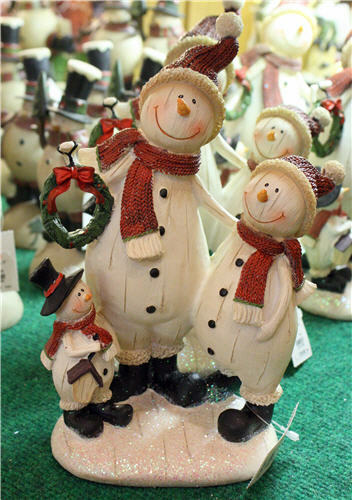 They don’t just have say, an aisle of snowmen decorations; they have an entire snowman department. I like these little guys and considered taking them home. I couldn’t figure out where I would display them. I took their picture instead. They have my all time favorite thing - Christmas ornaments. Oh friends, Bronners has two HUGE departments full of more ornaments than you can possibly see! I kept wandering off to ogle a new shiny. Husband said I was harder to track than a little kid in a toy department. Fortunately, the blue hair makes me easier to spot in a crowd. I am considering a new career as a snowman hat supermodel. 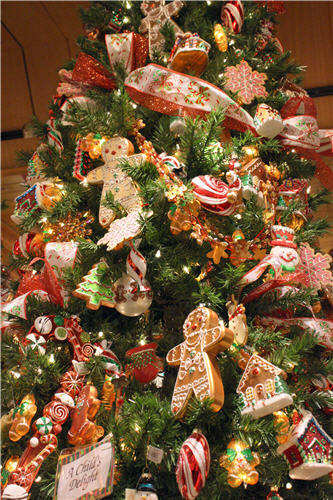 Shiny glass gingerbread and candy ornaments make this tree my favorite. This brown Christmas tree works because of the coordinating colors in the gingerbread ornaments tied in with the patterned ribbon. 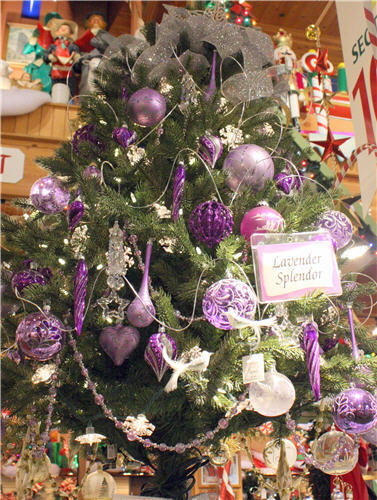 Here’s a fun tree in as nontraditional Christmas color palette as you can get. Hot pink, turquoise, and lime green. It is nice to see bead garland make a comeback. On the other hand, maybe bead garland never went out of fashion; it’s that I haven’t put it on my tree since we bought our house. Thoughts? 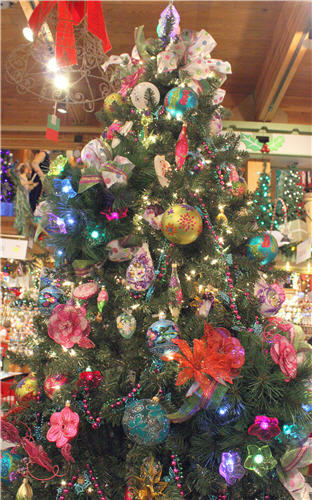 If Christmas, Miami Beach, and Mardi Gras had a baby it would be this tree. I took a photo of the Skittles tree because the puffy ribbon bow gives me an idea for this year’s tree topper. I have tons of ribbon in my Christmas tree décor box. artificial color and HFCS candy concoctions. 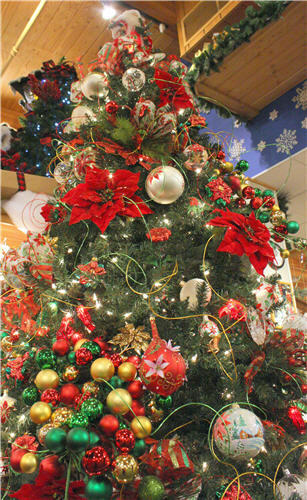 The poinsettias on this tree are the perfect solution if you have a hole between the branches of your Christmas tree. I’m not sure what those shiny curly twirly things are they used instead of garland but I like their added whimsy. be with a tree up his ho, ho, ho. Puuuuuuuuuuuuuurple! Like the trellis Christmas trees I havein my front yard. I really like the two toned bead garland. A flamingo palm tree Christmas tree because I like flamingos and warm, sunny places that serve umbrella drinks under palm trees. 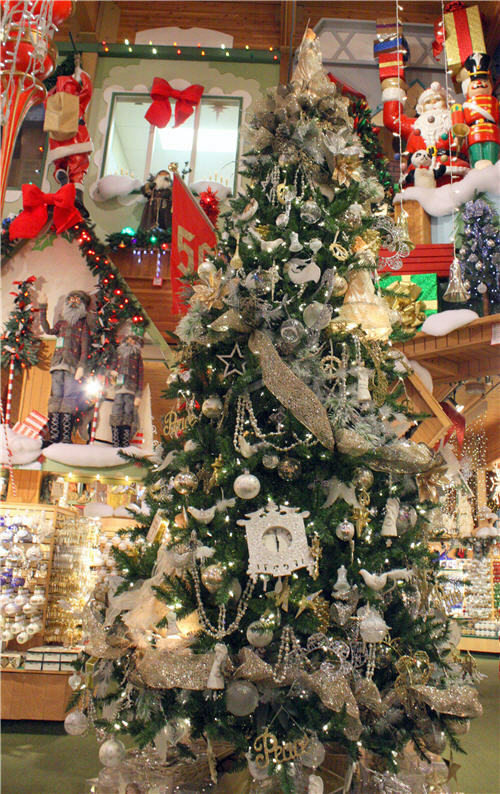 The final tree will give you a better understanding of just how big this store is. The tree topper sized ornaments highlighted on the tree do not look out of place. They look to scale. Loving the white ornaments. Using ribbon and bead garland together gives me an idea for our own Christmas tree. The clock ornament is the size of a real mantel clock. That. Big. Given the amount of time (and drooling) I spent in the ornament departments, it is a surprise I didn’t buy any for our tree. I wanted this guy instead. 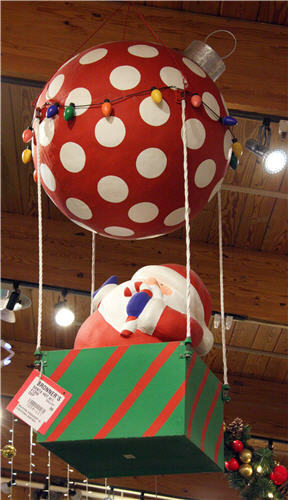 It has everything I like polkas dots, giant ball ornament, and fat cartoony Santa hanging from the ceiling. I’m sure those Christmas lights are energy efficient too. Santa cares about these things you know. Unfortunately, there was a problem fitting big fat cartoony Santa in our small economy size car. Not to mention Diva Claus demanded he drive back to Ohio instead of Husband even though he could not produce a valid driver’s license. 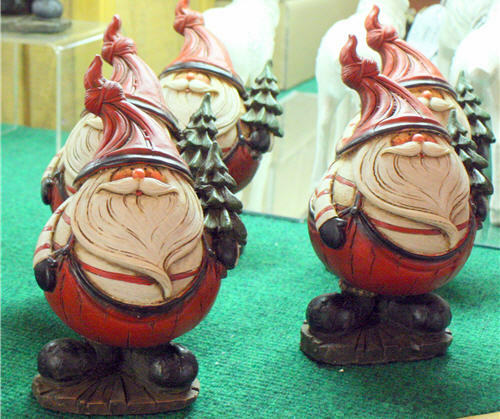 We made an unusual splurge and took one of these rolly polly Santas home instead. He was a perfect gentleman on the car ride home. This trip was just what we needed to distress and gear up for the holidays. Come back next week to see how I used these tree ideas to reimagine our Christmas decorations! Glad you took away some ideas for your trees at home. 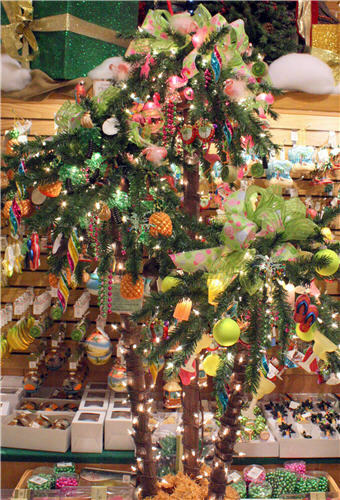 Hi Lisa, Re: Beads and Ribbons on the tree... 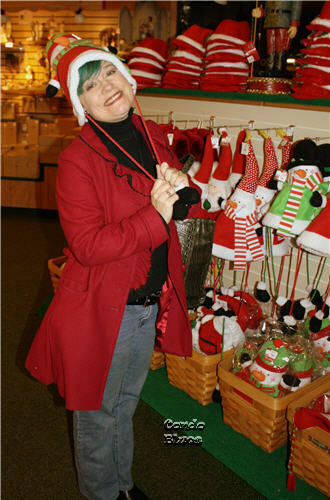 I used to put a gorgeous red/green/gold plaid ribbon all around my tree, and natural colored wooden beads, too. They looked great and very traditional. But then I rescued 4 cats, and cats being cats, let's just say that they couldn't resist either and the tree now has only non-breakable cat friendly ornaments. And they like peeking out from between the branches. I learned from my cat owner friends that Christmas trees are kitty jungle gyms. Or did I get that wrong? Awesome! I didn't see where they sold it. It's probably for the best. 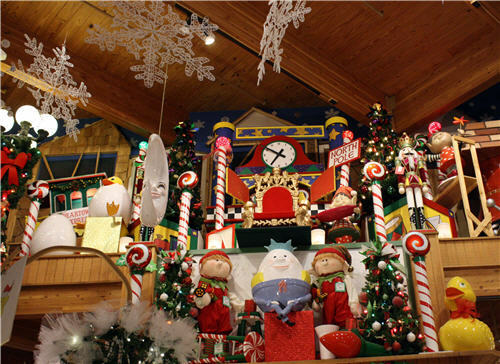 We bought enough stuff to keep Bronner's in the black as it is.